Monday’s ride took me down the hill and up the hill to Federal Hill for another trip to a yoga class. Wow, it’s not easy, this yoga thing, and I felt burnt afterward. I tried to remind myself that yes, like any other new thing, it’s hard. Patience, patience! I was a bit frustrated, though, so I did what I do when I’m frustrated and kept riding my bike. I headed over to Locust Point to drown my sorrows in sandwich. The ride home brought its own frustrations, the ones that come with riding a bike in the city. I’ve had city riding on my mind lately after hearing of a terrible bike death in New Orleans last week. It happened at a corner I know well–St. Claude and Elysian Fields–and a friend witnessed the whole thing–a truck pulling up alongside a cyclist and taking a wide right turn, overtaking the cyclist in the process, pulling him under the wheels, crushing him, all because the driver failed to check the side mirrors to see that there was someone there. It’s being called an accident, and the driver didn’t even receive a ticket. Part of the problem is the design of that intersection, but a big, big part of the problem is drivers who ignore basic rules in their hurry. It happened so many times on my ride back home–drivers pulling through crosswalks to make right turns, drivers with one wheel in the bike lane in an attempt to peek around traffic, drivers making so many short cuts. Whenever these conversations happen, it’s always about the cyclists who break rules, who ride the wrong way or don’t stop at stop signs and red lights or don’t wear lights, and yes, of course that happens. Drivers do the same things, though, and with much, much more disastrous results. I found myself getting increasingly angry as I watched cars block curb cuts and push me out of my lane. What’s your hurry? If we all heed the rules of the road in a courteous manner, we’ll all stay alive. I got off the bike for a breather at Fallsway and Madison–riding angry is not a good idea for me. I watched cars back up on the on ramp to I83 due to an accident ahead, and I wondered how many more accidents I was going to see as cars tried to back their way off the ramp and into traffic to avoid what turned out to be a five minute wait. And then I noticed the camera pointing into the grassy strip between the jail and the bike lane. What problem is that camera solving? How many resources are spent trying to make sure people locked in cages stay locked in cages, resources that could be spent designing infrastructure that helps keep everybody safe? What if we all slowed down just a little bit and reminded each other that we are each other’s responsibility, that we share this space? The bike ride didn’t dissipate my frustration, but it helped me see it all a bit more clearly. Stay safe out there, people, because I, for one, am not going to stop riding. 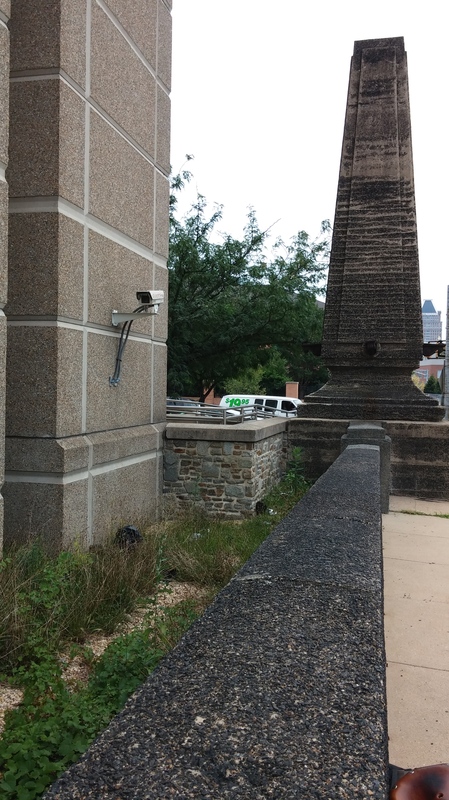 This entry was posted in bikes and tagged bike safety, Fallsway, Federal Hill, Locust Point, prisons, surveillance cameras. Bookmark the permalink.